You are here: Home / Skincare / Preventative Care versus Corrective Care! Preventative Care versus Corrective Care! More and more estheticians are performing preventative care rather than corrective care. A sign of the times with people have a better awareness of how to prevent aging; avoiding heavy drinking, smoking, sun worship, et cetera. People want to prevent their skin from showing signs of aging even before it happens, this is called preventative care. Corrective care, is when you already have signs of aging and skin conditions that need to be managed or lessened with facial and body services. It is an exciting time to be in the skin care industry! Technology is advancing, providing us with new products and device all the time. Constantly taking classes to stay up to date and well educated as well as going to trade shows helps estheticians and others in the beauty industry to learn more about preventive and corrective care. I hope that in the future corrective care will be a thing of the past. 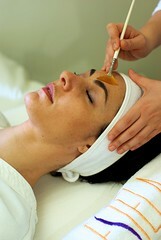 « When to have a Microdermabrasion or Chemical Peel before a Special Occasion!